Yesterday, we showed you some of the early concept artwork for the canned massively multiplayer online project set in the Halo universe. 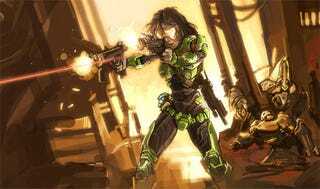 The MMO, codenamed "Orion" and at one point in development at the soon-to-be-shuttered Ensemble Studios, was scrapped after making it to a "working multi-player prototype." The artwork we showed you yesterday focused on specific character class designs, weapons and vehicles, but new images, which appear to be from the same Halo MMO project, offer a broader, more conceptual look at "Orion. "While the previous concepts have found more derision than we were expecting, these may appeal more to the Halo-loving audience, borrowing already familiar elements and reinterpreting them to fit into the MMO mold.